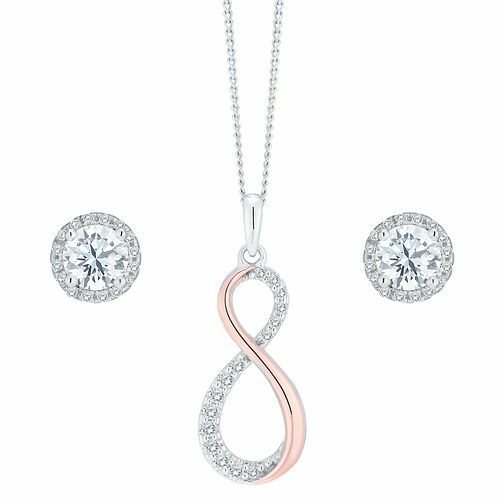 Made for glittering and glamorous texture, this lustrous pendant set includes a delicate carving of the figure of eight, often used as a symbol for infinity and is delicately embellished with a rose gold plated accent. The matching halo earrings finish the overall look with a luxury flair. 9ct Rose Gold & Cubic Zirconia Pendant and Earrings Set is rated 5.0 out of 5 by 1. Rated 5 out of 5 by Anonymous from Satisfactory service Elegantly simple. I bought this as a treat for myself.